4 July 2008, at 10:18a.m. UK - As the British food consumer becomes increasingly conscious of quality, egg producer, Clarence Court, has announced a new range of large eggs from old, pure bred hens. The Very Large Old Cotswold Legbars and Very Large Mabel Pearman’s Burford Browns will be sold exclusively through supermarket giant Waitrose this July. Clarence Court says that the decision to launch the Very Large range follows a growing demand from customers and egg aficionados. 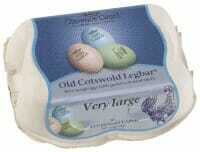 Founded in 1990, Clarence Court has pioneered the revival of traditional breeds of hens from old pure breed bloodlines. Unlike modern hybrids, these birds are bred for egg quality and not quantity. The result, eggs with a rich natural coloured yolk, dense texture and thick shell. Small wonder that chefs such as Mark Hix (who has created a bespoke series of seasonal recipes for Clarence Court), Gordon Ramsay and Jamie Oliver are fans, and regularly use the eggs in their restaurants. Clarence Court’s Very Large range will be available from Waitrose from 14th July and will cost £2.49.